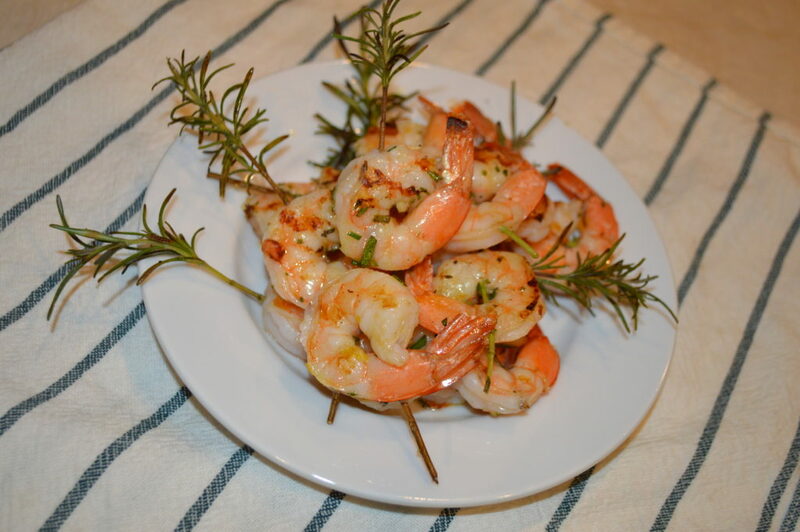 Rosemary Skewered Shrimp with blistered tomatoes and brown butter vinaigrette may be a mouthful to say but every little bit of this sentence will make sense to you when you take your first bite. I have to admit, I went fancy on you this time. 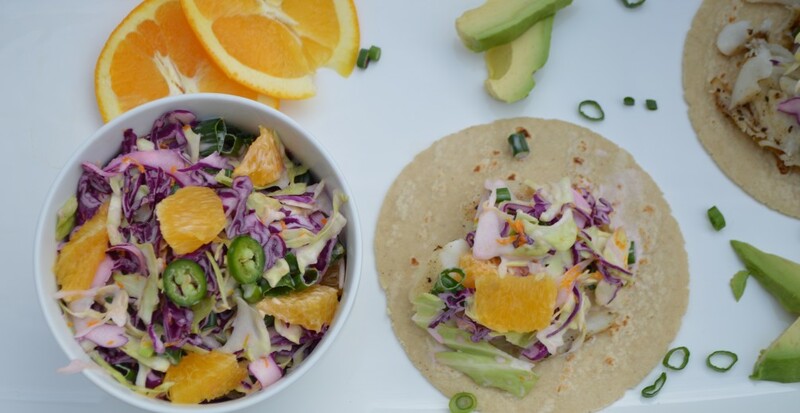 I’ve been publishing a lot of easy weeknight meals or ‘unfussy’ recipes but every once in awhile you need something in your arsenal that takes just a little bit more effort and has that ‘wow’ factor. And I think this dish has it. You will get points for amazing flavors plus some serious style and presentation props, too. And while there are several steps it’s really not difficult to pull off. Just take a breathe and follow these really easy steps…. Step one is getting those shrimp infused with lots of flavor. 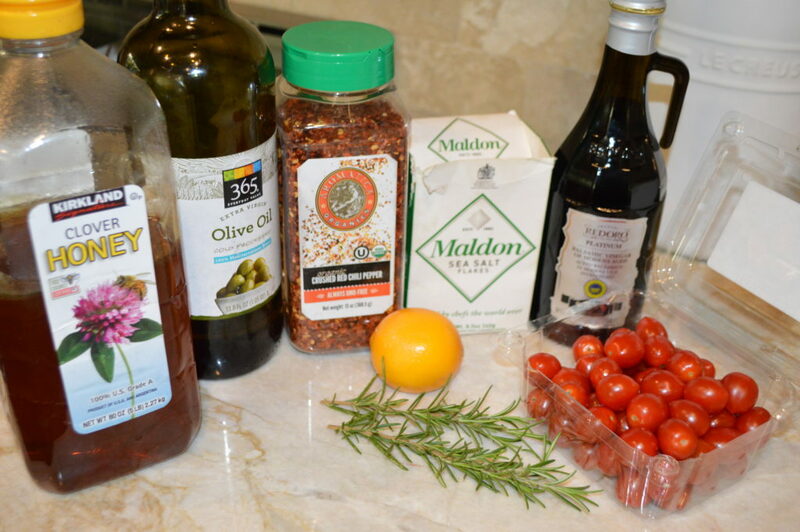 I used some simple, fresh ingredients that most of you will have on hand – garlic, olive oil, salt, lemon, and fresh rosemary. I have tons of rosemary bushed in my garden so I just cut some sprigs from that but if you don’t grow rosemary you can definitely find them at the grocery store year round. For the shrimp I just used the regular 21/25 count that came already cleaned with the tail on (fresh -not frozen – if you can find them). For this step in the recipe you just need some chopped rosemary so it doesn’t matter how long the sprigs are. Later, when you skewer them, length matters. 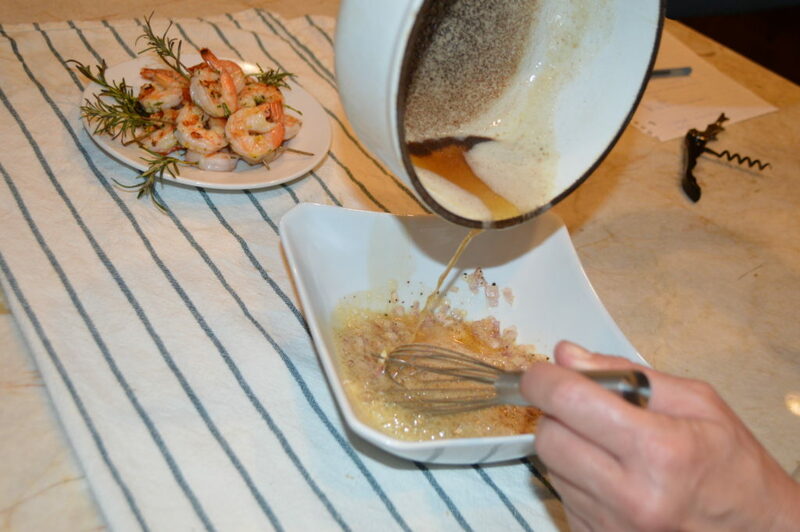 The shrimp should marinate for a couple of hours, ideally, but 30 minutes even will do in a pinch. 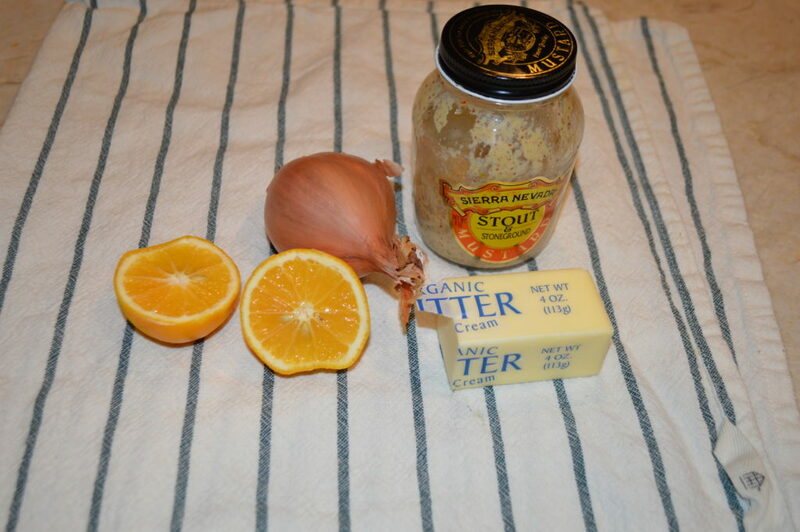 And I used Meyer lemons because that’s what I had on hand but you could use regular lemons and it would still be just as delish. 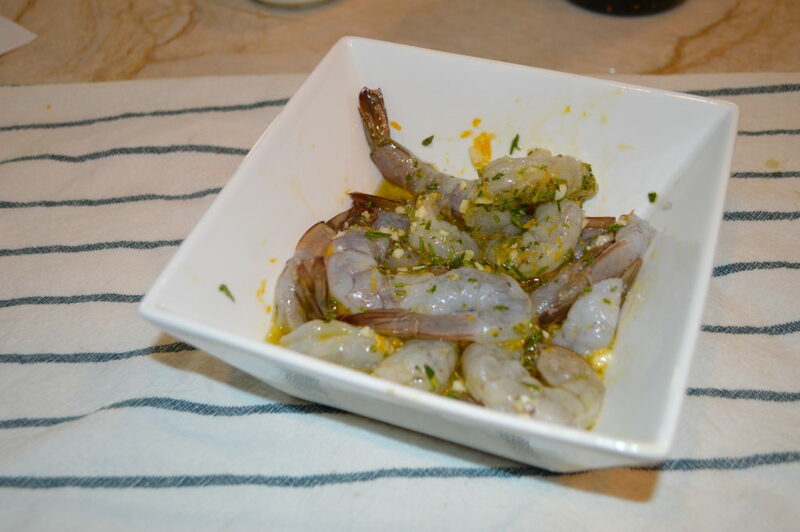 Combine the shrimp with the garlic, lemon zest, salt, a little pepper, and freshly chopped rosemary…. Gently stir to combine and then cover and refrigerate. Done and done. You’ll want to make the crostini before you cook the shrimp and make the brown butter vinaigrette and blister the tomatoes because the grilled bread will hold well. I like to do this step as close to serving as possible but it’s the first step I’d do. 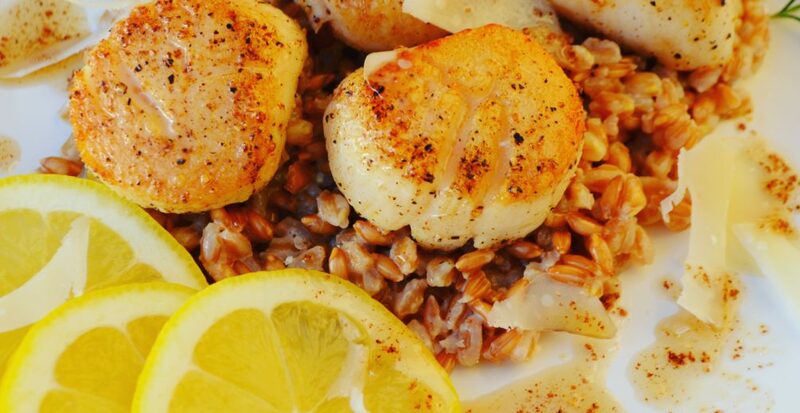 You don’t have to put them on a grill pan. This was just an option because I already had the pan out for the shrimp. 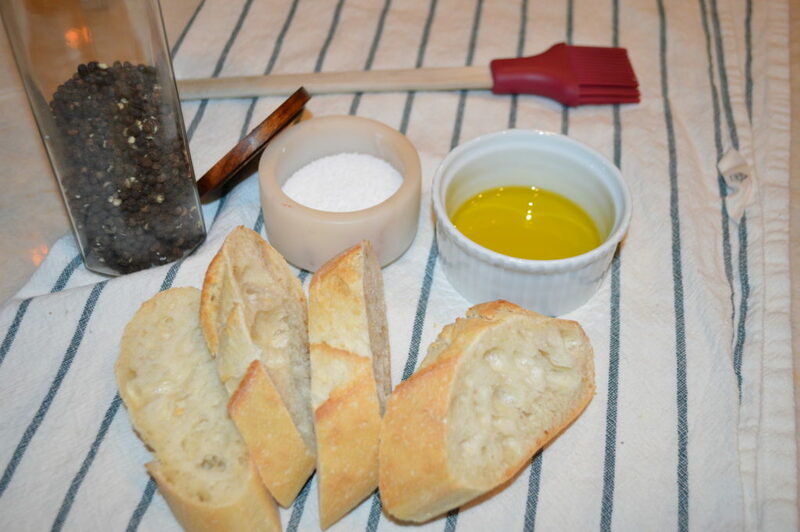 Alternatively you can put the bread on a baking sheet, preheat the oven to 325, brush with olive oil and season bread with salt and pepper and just bake for 12-15 minutes. 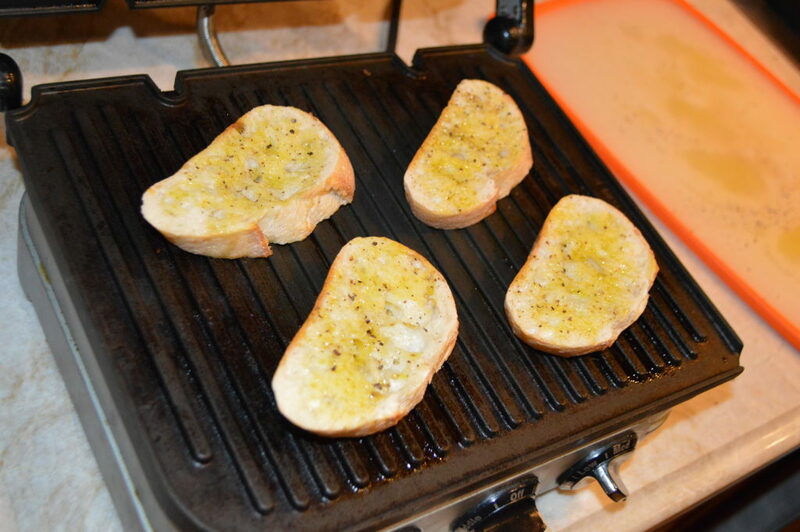 Then grill on the pan until golden brown around the edges but still a little soft in the middle. 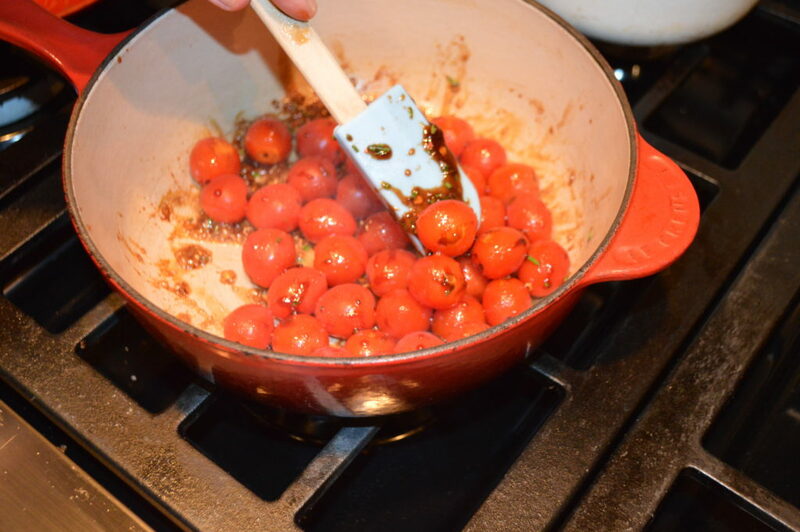 Set aside and move on to the tomatoes! 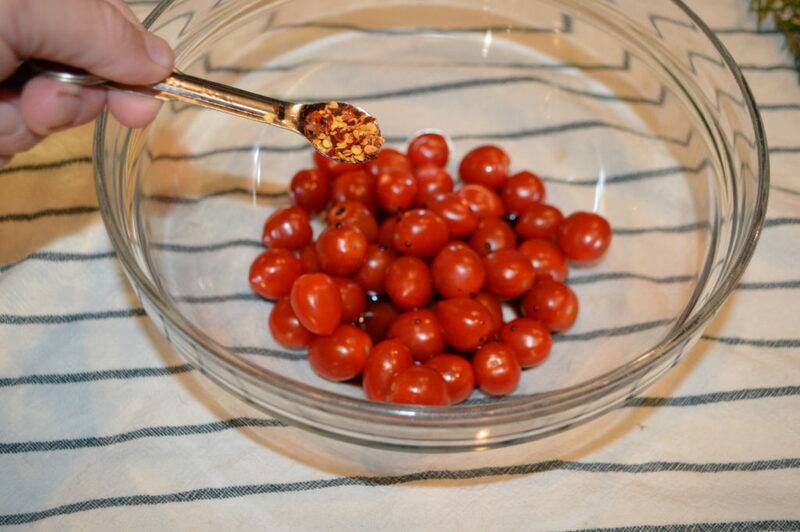 These are so easy because you just toss these little tomatoes in some yummy ingredients and throw them in a pan until they start to burst. The whole thing takes only minutes and they are just as good warm as hot. 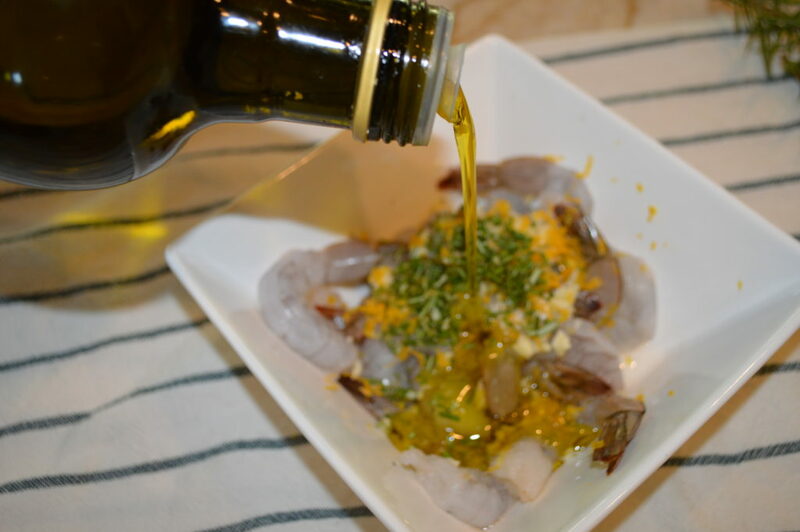 Remove the shrimp from the fridge at this point so the olive oil can come back to room temp and not congeal. 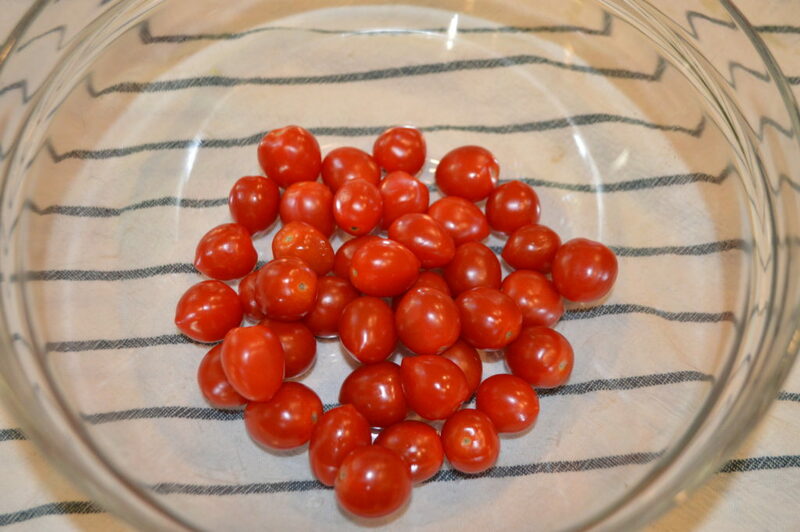 Place the cherry tomatoes in a bowl. 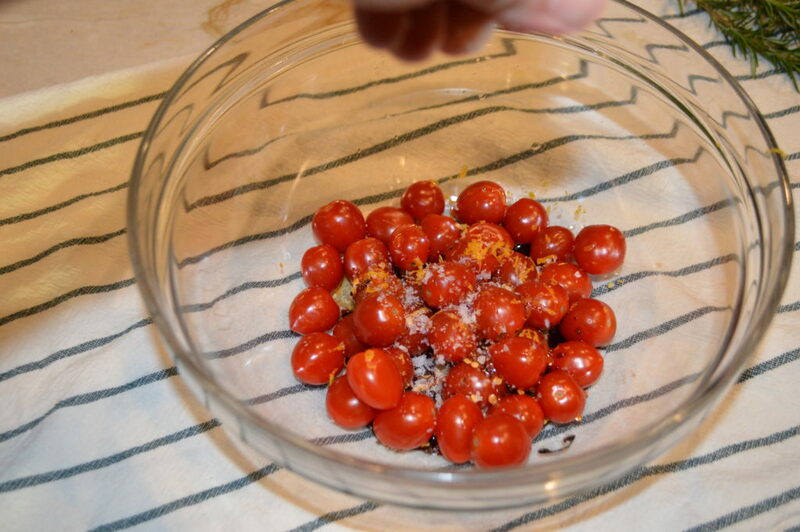 Add the fresh chopped rosemary then mix the tomatoes and ingredients with a spatula and they are ready for the pan! Find a medium (non-reactive) pan. I love my Le Crueset enameled pan. Heat over medium high heat and add in the olive oil. Until the skin just starts to caramelize and break. Remove from the heat and set aside. 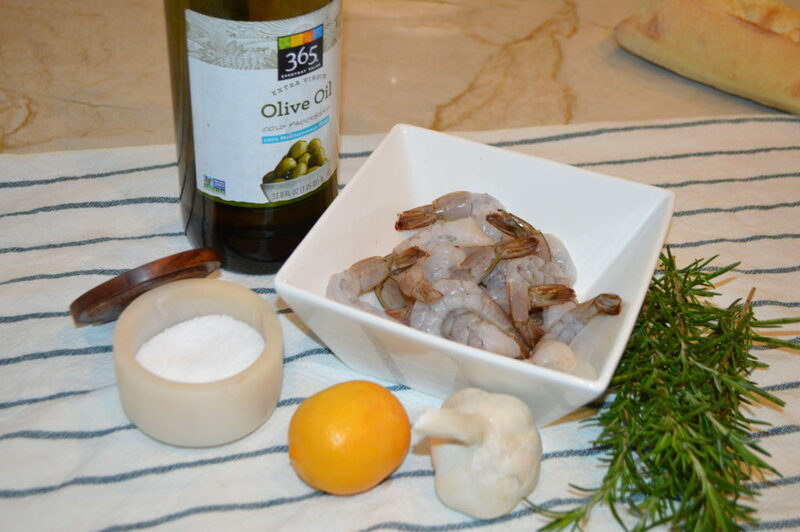 Now take those beautiful, marinated shrimp and shake off any excess marinade. Then take the rosemary sprigs and run your finger along the bottom part to remove all the pines. You can save those for another use if you want. You just need a little bit of pine on top and you want to use the sturdiest sprigs you can so they hold up to the grilling process. Skewer all the shrimp evenly across the sprigs. 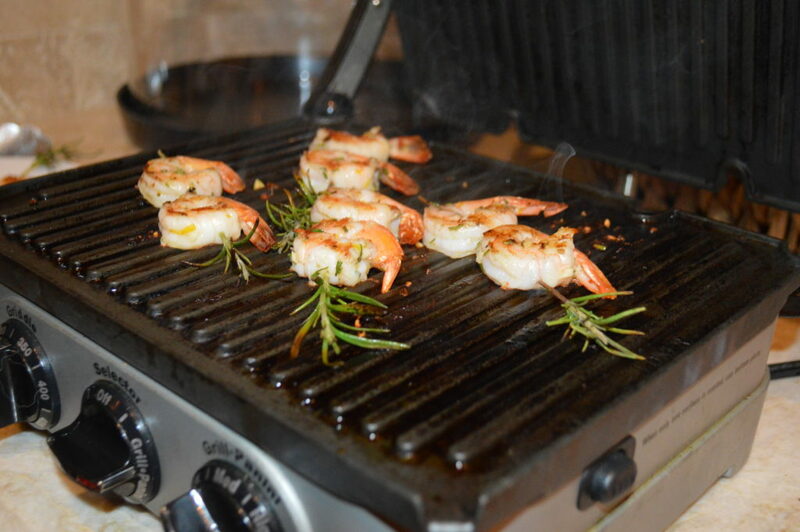 Heat the grill pan to hot and add a little more oil to the grill grates so the shrimp doesn’t stick. When it’s hot place those shrimp on the grill. Turning once when light pink. Don’t over cook. 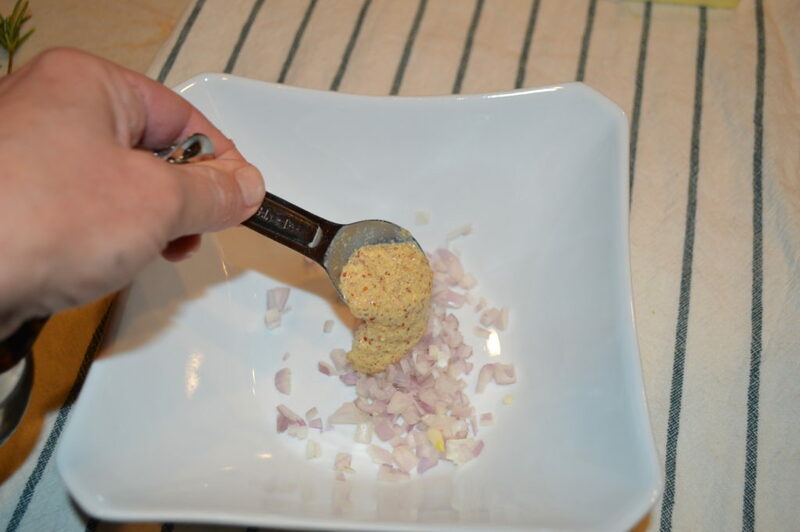 In a medium bowl place the diced shallots and add the stone ground mustard. Then the lemon juice and season with salt and pepper. Melt the butter in a heavy-bottomed pan. Cast iron recommended…. Let it get toasty brown. This is where the nutty flavor comes from. Don’t worry if the bottom layer gets a little grainy. You can strain that out. 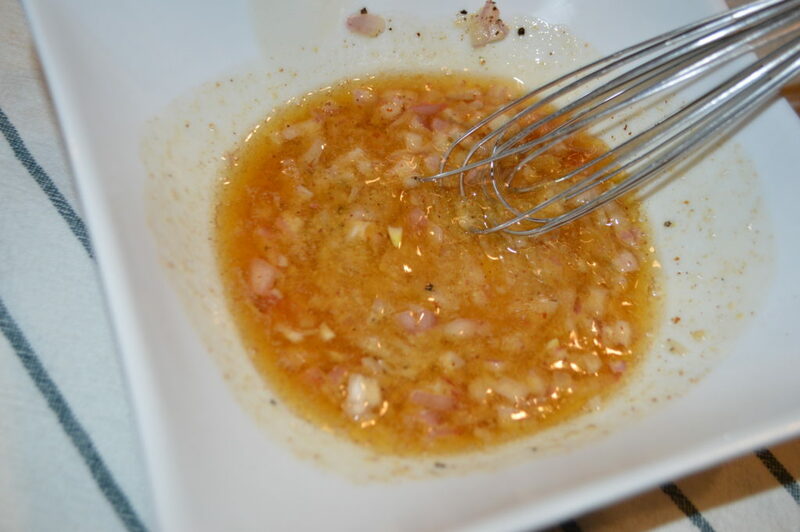 Then remove from the heat and pour over your shallot, mustard, lemon mixture and immediately start whisking to emulsify. So now to assemble this scrumptious dish you can do it anyway you want. Put the shrimp on top of the crostini. You can lay them flat or stick them in the bread (like a flag). 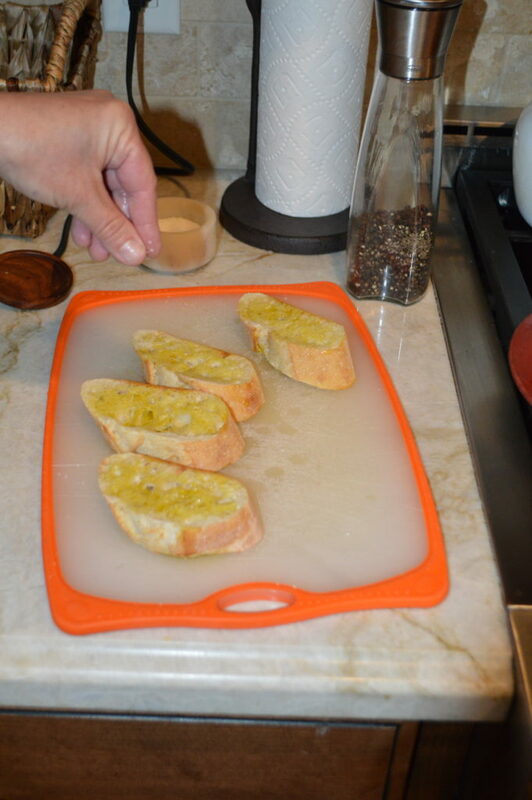 Add the tomato to the plate or right on the bread as a kind of spread. 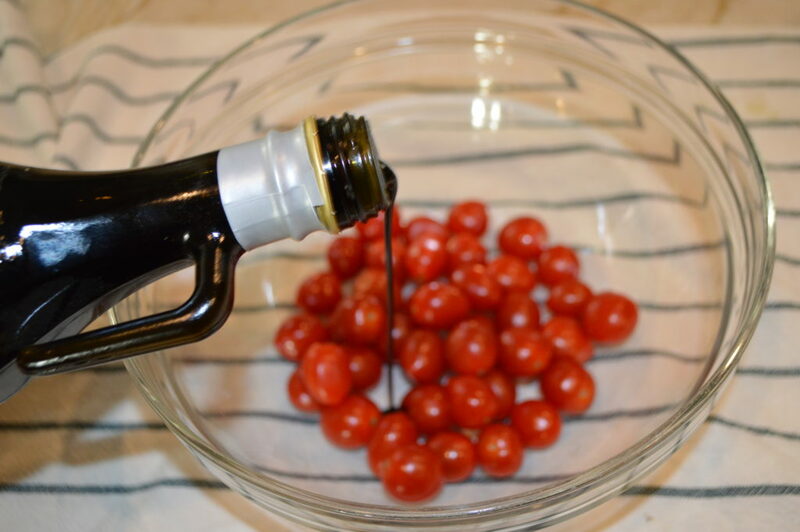 And then drizzle the vinaigrette around the plate and a little on top. I used a bit of fresh arugula for some added green but that is completely optional. Marinate the shrimp. 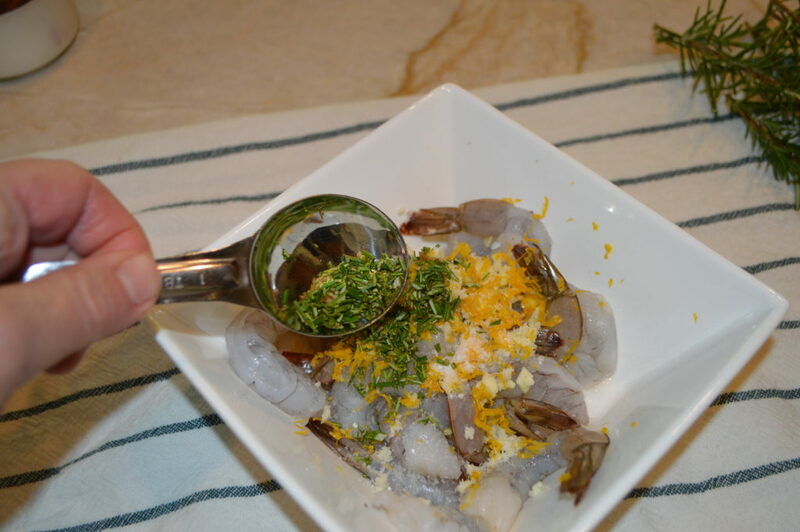 Combine the cleaned shrimp with the garlic, lemon zest, olive oil, chopped rosemary, salt and pepper. Cover and refrigerate for 2 hours. 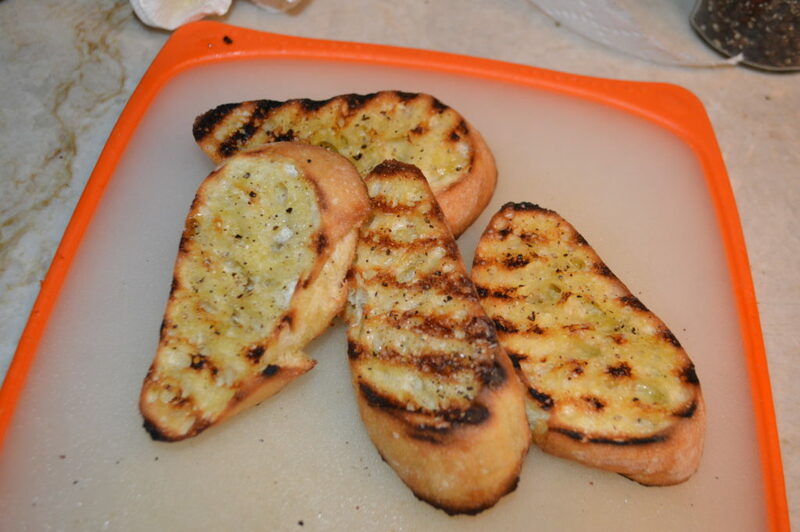 Make the crostini. 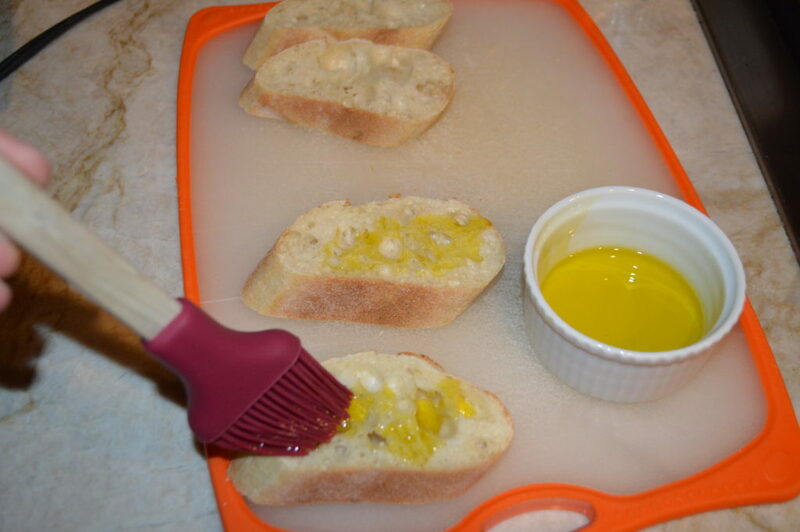 Brush both sides of the sliced bread with olive oil and season with salt and pepper. Heat on a hot grill pan brushed with a little oil until golden brown. 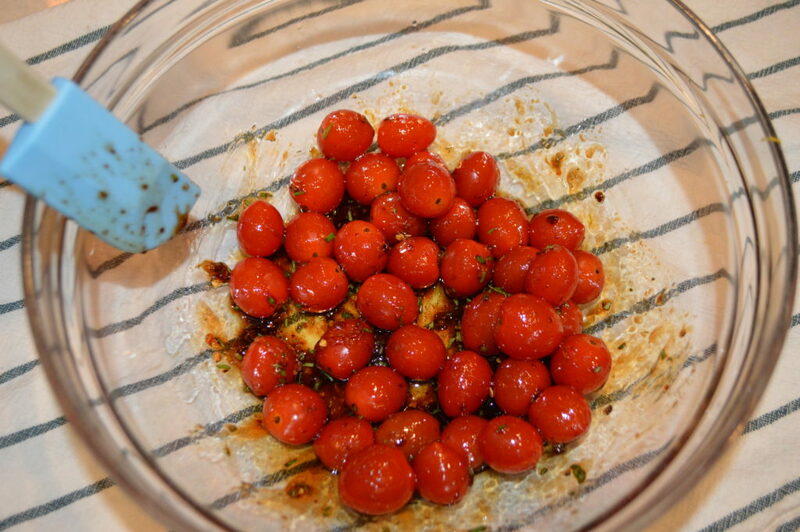 Remove shrimp from the fridge and make the blistered tomatoes. 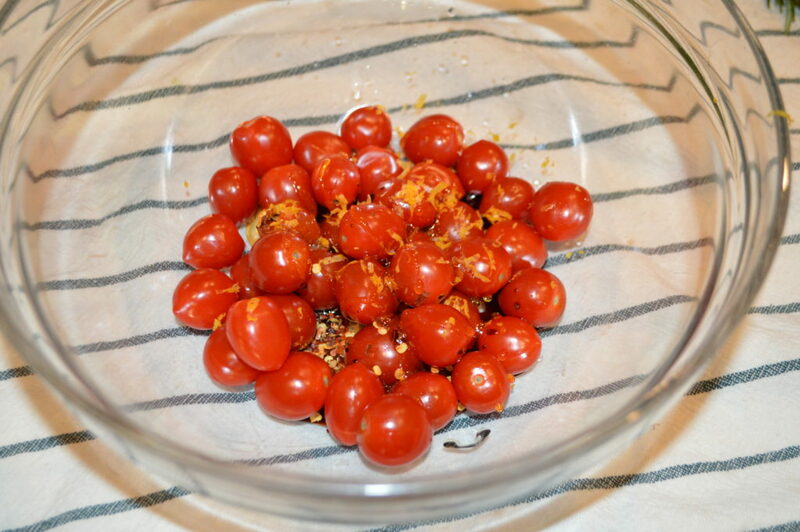 Combine the tomatoes, balsamic vinegar, chili pepper flakes, honey, lemon zest, sea salt, olive oil and rosemary in a bowl. Heat a heavy pan over medium high heat and add in the mixture. 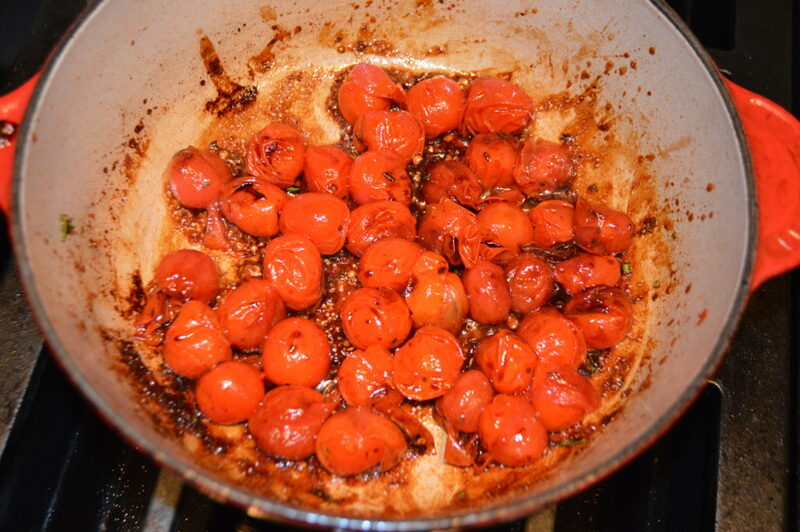 Cook until the tomatoes just start to burst and get a little caramelized on the outside. Add about another teaspoon of fresh rosemary and set aside. Cook the shrimp. 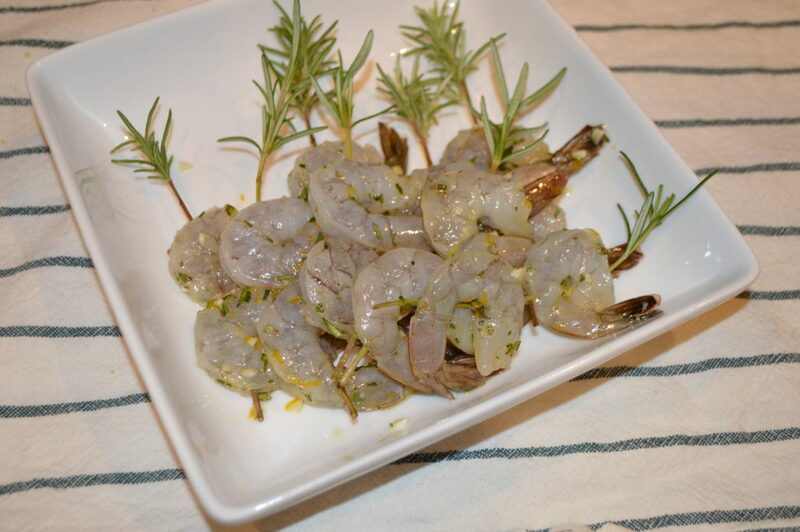 Remove from the marinade and place shrimp on the rosemary skewers. Heat the grill pan over medium high heat and add a little more oil so the shrimp don't stick. Cook 2-3 minutes per side or until pink - careful not to over cook. Set aside. Make the brown butter. 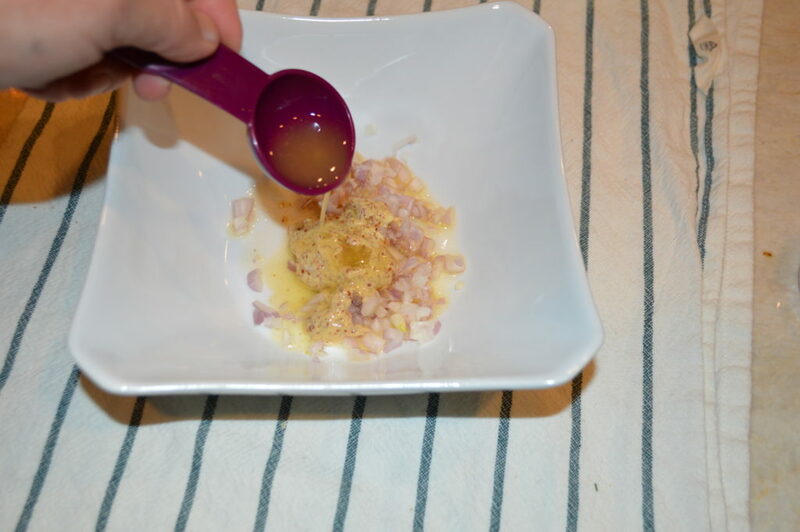 Combine the shallot, mustard, lemon juice and salt and pepper in a bowl. 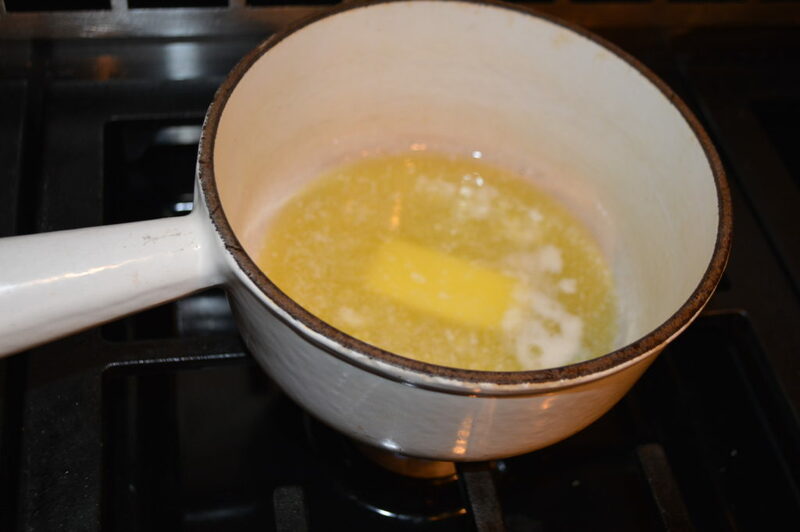 In a small, heavy saucepan melt the butter on the stove top over medium heat and watch carefully, swirling as needed. 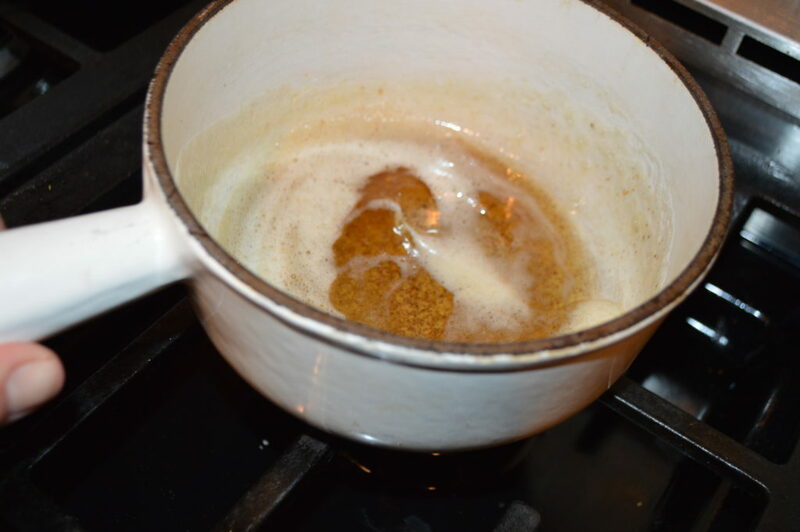 When the butter turns a deep golden brown remove from the stove and pour over the shallot and mustard mixture, leaving any browned bits or sediment in the pan. Whisk vigorously to emulsify. 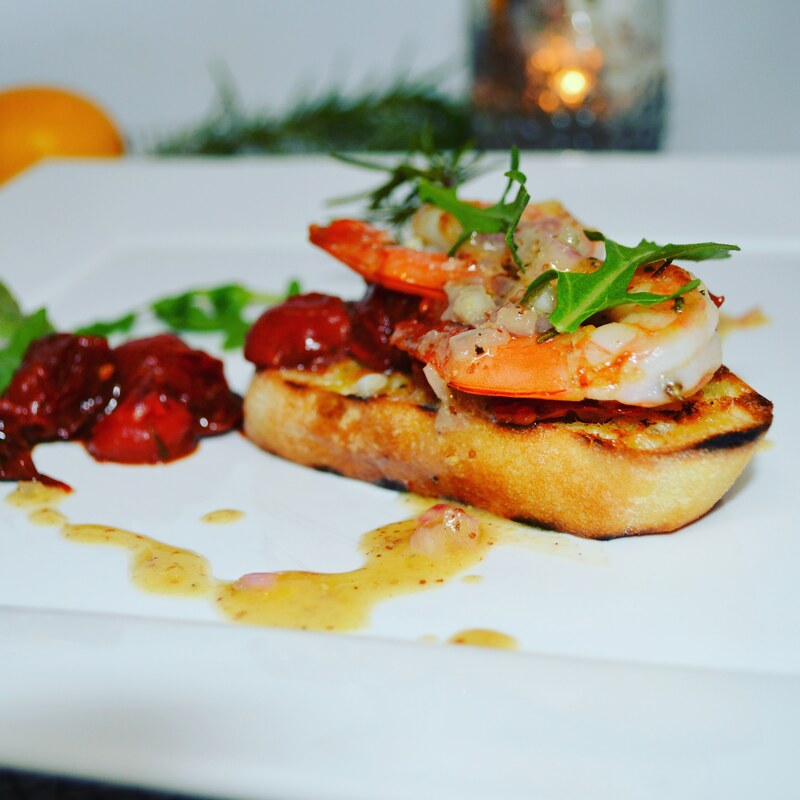 Assemble dish by placing the blistered tomatoes on the bread and topping with the rosemary shrimp. 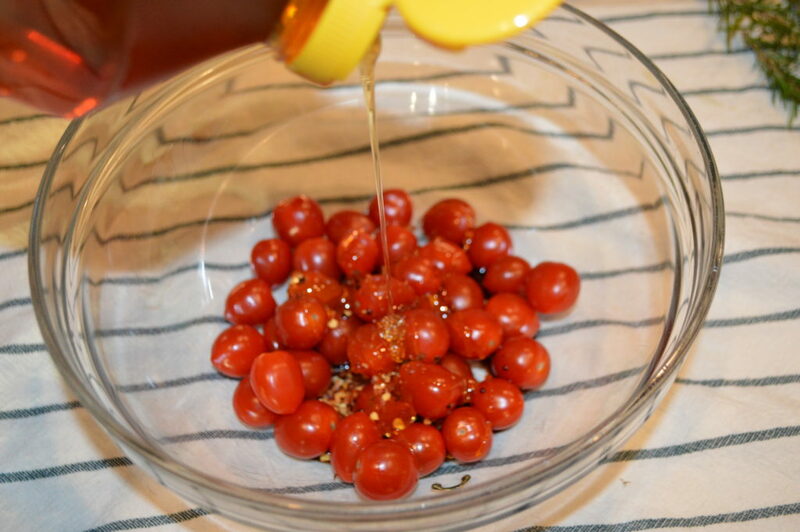 Drizzle the brown butter vinaigrette over and around the plate. Garnish with arugula, if desired.